On Thursday, March 7, the U.S. House of Representatives Subcommittee on Water, Oceans, and the Wildlife convened a hearing to examine the threats facing the endangered North Atlantic right whales. Anderson Cabot Center Vice President Dr. Scott Kraus, was invited to testify as an expert witness. With fewer than 415 right whales alive today, the hearing examined how the Trump Administration’s offshore drilling plan could hurt the remainder of this endangered species. The majority of the hearing was dedicated to the testimony of NOAA Assistant Administrator Mr. Chris Oliver, but Dr. Kraus and Cornell University’s Dr. Christopher Clark were witnesses for the majority members of the subcommittee. Dr. H. Sterling Burnett of the Heartland Institute was invited by the minority party. Anderson Cabot Center Vice President Dr. Scott Kraus testified before the Water, Oceans, and Wildlife Subcommittee on March 7. 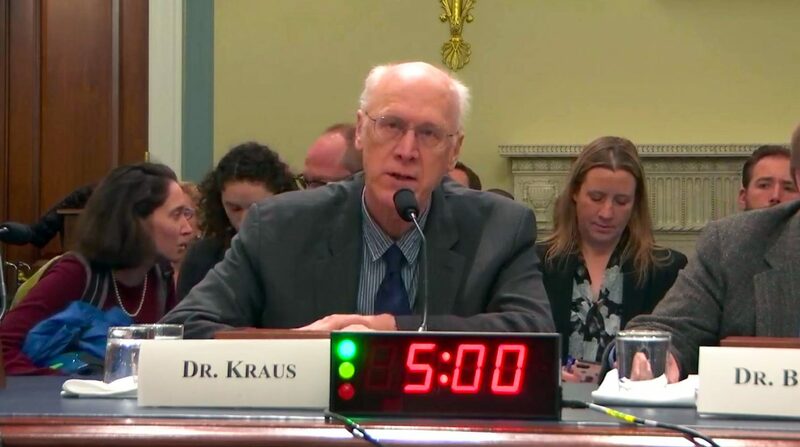 During his testimony, Dr. Kraus cover the stressors faced by the North Atlantic right whales, including entanglements in fishing gear, ship strikes, pollution and the stress from underwater noise, disturbance and masking from underwater noise, and pollutants. The constant exposure to seismic airgun noise is sure to increase chronic stress, negatively impacting an already stressed population. So, while the seismic surveys themselves are unlikely to kill a whale directly, the added stress of the constant airgun blasts in their habitat may limit their ability to survive and thrive in an increasingly hostile environment. Without dedicated efforts to reduce these stressors the species is likely to go functionally extinct in about 20 years,"
To rebuild the species, we need more calves, says Dr. Kraus. We need to give the mothers and their calves “every possible chance.” That means removing stressors, not adding them. Dr. Clark likened chronic impacts to second hand smoke. It won’t kill someone immediately, but we know, over time, it can cause substantial damage. That’s what chronic noise to right whales.